MyPlate is the government’s newest food icon, and dietitians and experts argue that it’s easier to understand than the “confusing” Food Guide Pyramid – which was originally introduced in 1992 and updated to “MyPyramid Food Guidance System” in 2005. Critics of the Food Guide Pyramid have described it as confusing and difficult to understand. The original version, which is the more widely recognized pyramid, actually showed a hierarchy of the food groups, and was easier to understand. 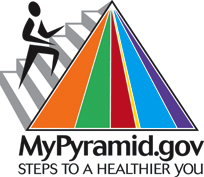 The updated 2005 version had vertical blocks, and a person stepping up steps (which was supposed to remind Americans to exercise). According to the press release released yesterday by the USDA, MyPlate is an “uncomplicated symbol” and “easy-to-understand visual cue” that will help Americans adopt healthier eating habits that are consistent with the recently released 2010 Dietary Guidelines for Americans. MyPlate is exactly what it sounds like. It’s a plate that is divided up into four color-coded food categories: fruits, vegetables, grains, and protein. Next to the plate is a circle that represents dairy products. MyPlate doesn’t show “servings” or “portions” for its dietary recommendations. It just shows Americans what the food should look like on their plate – half of their plate should have fruits and vegetables. 1. Balance Calories – Enjoy eating your food, but consume fewer calories. Don’t eat huge portions. 2. Make Healthier Food Choices – Make sure that half of your plate is fruits and vegetables, and at least 50 percent of your grains are whole grains. Instead of whole milk, choose fat-free or low-fat (1 percent) milk. 3. Reduce Salt and Sugar – Always compare the sodium (salt) content in foods you buy, such as bread, soup, and frozen meals. Try to choose foods that have lower salt numbers. Also, drink water instead of sugary drinks and sodas. As part of this new initiative, the USDA (the U.S. Department of Agriculture) encourages you to visit its new website, ChooseMyPlate.gov. The USDA also encourages all Americans to take photos of their plates and share them on Twitter using the hash-tag #MyPlate. You can also share with your plate with the USDA via their Flickr Photo Group (www.flickr.com/people/usdagov). 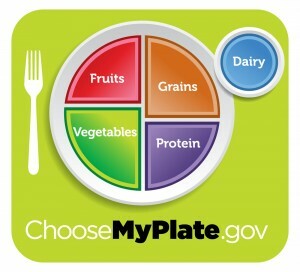 What do you think of MyPlate? 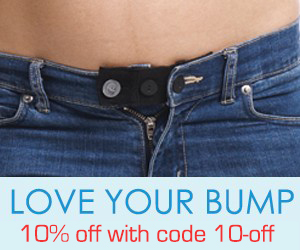 Do you think it’s an awesome idea, or just dumb? Did you find the Food Guide Pyramid? Do you think Americans will follow this new guide, or just ignore it? I am not very good with English but I get hold this really easy to understand . Hi mates, I am for a second time here, and reading this piece of writing related to Search engine optimization, its also a good article, so keep it up. I’m guessing there will be a lot of uneducated parents who will fill their kids plates like the diagram and force them to eat it “because it’s healthy”. Children eat smaller portions than adults and I don’t think this will help end childhood obesity. Heck, adults shouldn’t even be eating an entire plate full of food.